Day 32, 15:35 – Melle | Starsway - The unforgettable walk! This was another one of the French nightmares. I arrived on Sunday afternoon, after 7 hours walk or so in Melle, a really larger town and they keep telling me that everything is closed and that it will be difficult to find something to eat, maybe at night. Fortunately, I heard some music from somewhere which coincidently was close to a little bar where they were having a kind of street party and two guys from Strasbourg were making paella. When they heard where I came from and where I intended to go, they served me like a King. 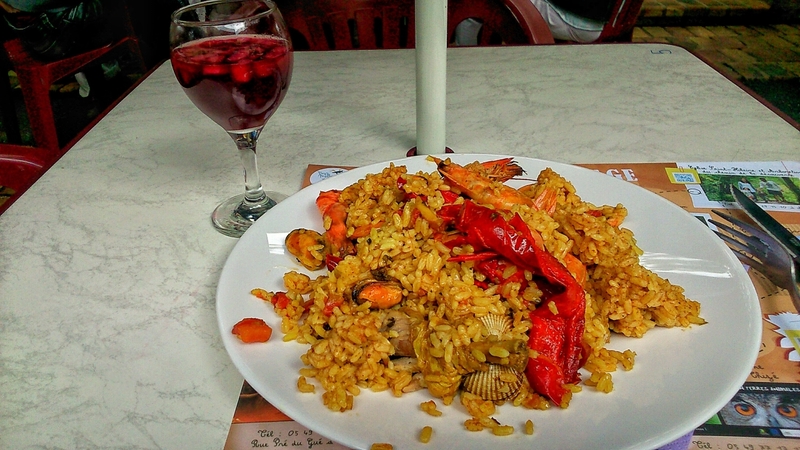 The paella was excellent, the sangria also, but man, you really shouldn´t drink when you still have some hours to walk! When I arrived in Brioux sur Boutonne at night and the only hotel in town was closed (as so many times), Francoise from the local Saint Jaques association spotted me on the street and offered me the association’s house, for sleep. So for one night I had a really nice house just for myself. When she asked me where I came from and I responded her, Aachen one month ago, she couldn’t believe it. She told me that never before anyone passed here from such a long distance, in such a short time. I was not really surprised.